What Is Business Casual Attire For Men And Women? In the ever-changing landscape of fashion in the workplace, business casual can range from a mixture of blazers and work-appropriate tops to heels and button-downs. The main problem with defining how to dress business casual is the lack of an across-the-board definition. However, there are some unspoken rules that apply to most offices. Business casual is typically defined as no jeans, no shorts, no short dresses or skirts for women, optional ties for men, and a rotation of button-downs or blouses. Business casual dressing is more a list of "don'ts" as opposed to "do's," although they are meant to be guidelines for a professional appearance. For men, stick to a range of button-downs and polo shirts. Typically, collared shirts that are long-sleeved are the most appropriate. As a second choice, short-sleeved polo's or button-downs may also work for your office. While not always necessary, throwing on a well-cut blazer or jacket adds an extra professional touch to your run-of-the-mill office ensemble. It's generally safe to stick to plain-colored coats such as grey, black and blue. It's a good idea to have a blazer on hand for formal occasions and may be the best look for a job interview. The majority of offices allow for sweaters or sweater-vests. Chunky-knit sweaters may be appropriate during the winter, but in general, stick to fine-knit sweaters that can go over button-downs or shirts. Some progressive offices allow for jeans, but sticking to dress slacks and chino pants (commonly known as khakis) will ensure you're well within your dress code standards. While it depends on how adventurous your office is, try to stick to plain or neutral-colored pants like black, grey, tan, or dark-toned colors. Avoid bright colored bottoms (neon yellow isn't always the most professional, unfortunately). Always include a belt. Loafers or dress shoes are always appropriate. Avoid sandals and sneakers. There aren't too many rules about color, but keep it as professional and polished as possible. Nearly every department store carries work wear for men. Macy's (M - Get Report) , Hugo Boss (BOSS - Get Report) and Ralph Lauren (RL - Get Report) are popular for a one-stop-shop experience for business casual. While the length and tightness may vary depending on your particular office, dresses and skirts that reach about knee-length (or below) are always a safe bet when dressing for the job. Avoid skirts and dresses that are too tight, too low, or too dressy. In terms of color, business casual doesn't have too many restrictions. Tailored or wide-leg pants dress pants, chinos, or suit pants are always appropriate. For certain offices, jeans may be worn, but be sure to check your office's dress code policies beforehand. Printed pants or bright colors are often appropriate, but it can still be helpful to gauge your office's atmosphere beforehand. Standard for both men and women in the office, blazers are a classic professional staple that seems to be a universal element of a good dress code. It is helpful to keep a rotation of black, grey, blue or other colored blazers in your closet. Bright colored-blazers can be fun, but make sure they are still versatile enough to wear with different outfits. The particulars of the top depends largely on the individual office dress code (or the individual themselves), but a nice fitted, flowy, and/or ironed blouse or button-down is always appropriate. Try to keep brand logos to a minimum. Closed-toe heels, flats, or loafers are typically the order of the day when it comes to women's business casual fashion. While the particulars of the shoe (whether open-toed, stiletto, or other) are left up to the employee or job, it is always safe to choose one of the above (sandals and sneakers are usually frowned upon). While the options are nearly endless, clothing brands like Ann Taylor (ANN , Banana Republic (GPS - Get Report) , and Mango carry most of the staple pieces you'll need for your office wardrobe (think tailored pants, blazers, blouses, heels). The short answer is, well, no. But given the vast array of jobs, progressive offices, and corporate cultures, even jeans are up for debate. As a general rule, it is far safer to err on the side of professionalism and go without the jeans. However, many offices do allow for jeans, so it is important to check with your company's dress code beforehand. If you are lucky enough to have a more casual workplace that allows for jeans, try to stick to dark-wash, tailored jeans. Avoid jeans with rips, holes, prints and embroidery, or light wash.
A big source of confusion for employees can be the difference between business casual and business professional. Typically, business professional standards for men and women can be summed up in a word: suits. For men, business professional includes a suit, neutral dress shirt, dress shoes, belt and a tie (many business professional jobs also require neat and clean grooming). For women, business attire typically consists of either a pantsuit set, tailored skirt and blazer combo, or a knee-length tailored dress. Closed-toed, low heels are typically preferred. So, while the differences between business casual and business professional may be more up to you or your boss' judgment, you typically don't need to don the full-on suit for a business casual atmosphere. Apart from the occasional "Casual Friday" in the office, the best way to dress business casual is to plan ahead and shop with guidelines in mind. When shopping for your job, try to purchase an easily versatile collection of a few different shirts, pants, skirts or dresses, and shoes. Dressing business casual isn't rocket science, so much of the particulars are left up to your judgment. 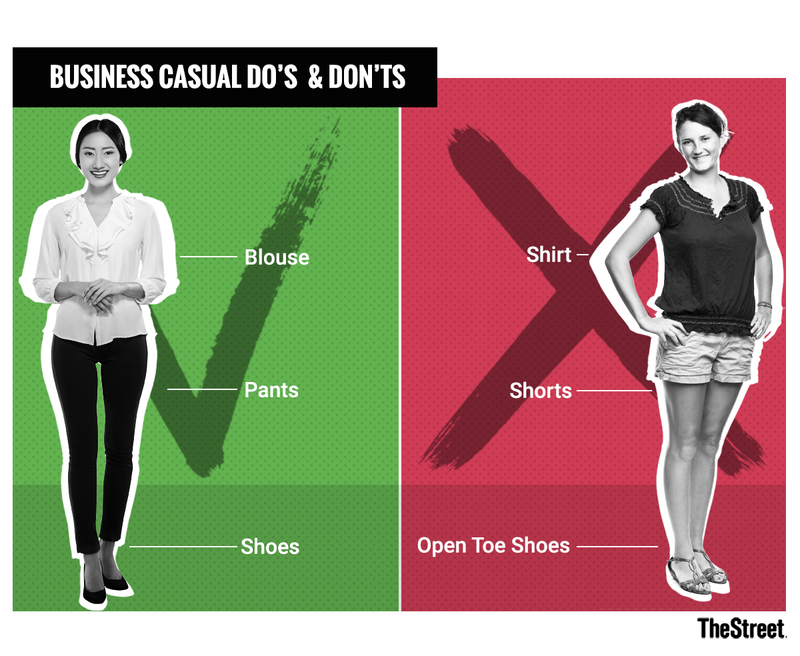 Still, the key is to remember the main do's and don'ts that are almost always a part of a business casual office dress code. 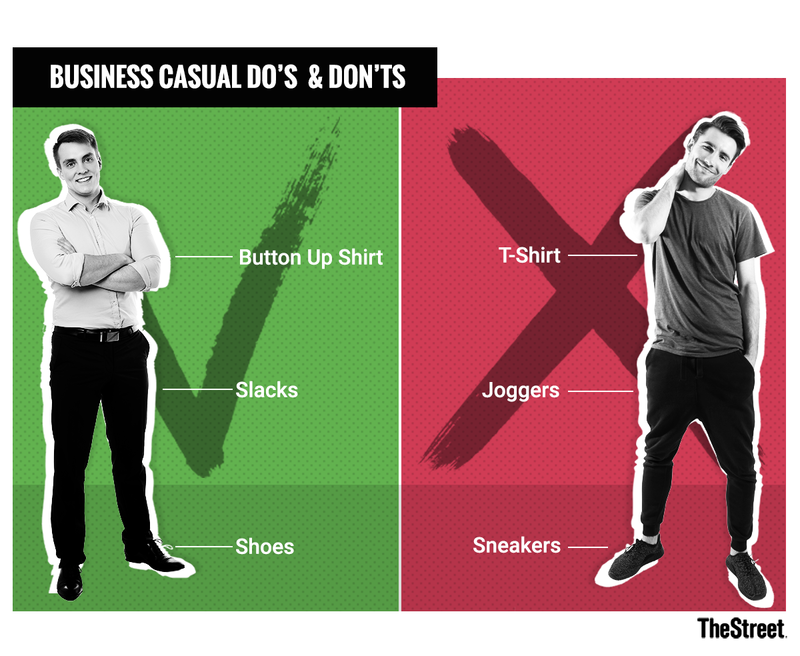 Although these will vary, check out this hit-list of the main do's and don'ts for business casual before the next time you hit up your go-to store. DO: Choose clothes that fit you and make you look professional, such as tailored pants, blazers or jackets and dresses. DON'T: Wear baggy, old, or logo-ridden shirts or pants. Keep your ensemble looking fresh and clean. DO: Buy a few pairs of neutral pants that will work with different shirts. This will save you money and keep your outfits looking office-appropriate. DON'T: Wear jeans, sneakers, distracting jewelry, or sandals to the office. These, for the most part, belong in your off-duty repertoire. While the Oxford Dictionary defines the word business casual as "intended to give a professional and businesslike impression," the main key is just that - to wear something that gives a professional impression to your boss and co-workers. The particulars are largely up to you.